I have a big, fat problem with this book and it caused me some issues. You see, the cover art is deceptive, a point which prevented me from reading and reviewing this book earlier, unfortunately. When I first picked up HOPE, I thought it was a story about Barack Obama becoming president and changing the world. It is not. When providing books about politics and religion to public school students, I want things even-steven. Angry parents, claims of indoctrination and controversies do not do the public school teacher any favors. At the time, I didn’t have any comics on President Bush or Ronald Reagan. I’ve since rectified that, obtaining political comics representing various positions of the political spectrum. Here’s the kicker. This book isn’t about Obama or his presidency. My first clue should have been the historical fiction banner on the front of the book. I took one look at the cover and was worried. So I set it aside – editorial discretion is not an exact science. Black History Month sparked my interest again and I picked it up. This time I actually read the banner on the front and the back cover, and I am glad I did. HOPE is not about the president. It’s not about politics. HOPE is an inspirational story for African Americans in poverty, for those in despair, those who feel oppressed or chained in their own circumstances. Anton Fox is a 14-year-old African American living in the projects –– the Congress Housing Projects, specifically. He has no hope for his own future and feels confined by the projects and poverty around him. Anton is failing his math class and takes his failure out on Mr. Charles his teacher. This good kid finds himself at the school on an early Saturday with red spray paint can in hand to take his anger and frustration out on his teacher. He no more than puts paint to brick when Officer Ernie Griggs catches him red canned. A first offense only lands Anton with community service, but it is still hard word and his mother is disappointed in him. It just so happens that he is charged with picking up trash on the National Mall in preparation for President-Elect Obama’s inauguration the next day. Anton discovers that he is not as imprisoned as he thinks if he will use his head (stay away from drugs, gangs, crime.) Office Griggs, you see, grew up in the projects and knows Anton’s mother. His story is one of becoming something more and moving out of poverty for a better life –– a story that Anton rejects. He is an adolescent and what teen doesn’t find the droning of adults about hope and futures and focus obscenely boring? The community’s excitement about the first African American president is more annoying that inspiring on Anton. History, it seems, is lost on him. His persistent mother and his community service manager stick with Anton and teach him that just two generations ago –– 60 years –– a black person could not walk into a restaurant and eat with white people or drink at the same water fountains or go to the same schools. Now, an African American is holding the highest office in the land. Despite Anton’s harrumphs, his mother drags her boy to the presidential inauguration to stand in freezing temperatures for hours just so her son can witness one of the most social and cultural events of the boy’s life. It is then that Anton comes to grips with his history, his heritage and his future. Anton realizes that the ghetto is not a predetermined prison cell. His mother wants more for him and for the first time in his life, he wants more too. The construction of the book is very contemporary, urban if you will. It is a 56-page, comic-prose hybrid comprised of nine short chapters. It is smartly designed to help young people and struggling older readers make their way through the story. There is also a dictionary, pronunciation guide, discussion questions, bio on President Obama, and other supplemental information. Connecting students with real life and future prospects is an exhausting and sometimes seemingly fruitless endeavor. For those living in situations of poverty, abuse, neglect, or crime education often becomes a pointless exercise for them. Survival tops the hierarchy when it comes to existing. HOPE takes on the challenge of bringing hope to African American students by using a pivotal event to engage students, connect them to history and culture, and give them other options. HOPE is a bit after-school specialish, but lots of successful efforts in elementary schools are after-school specialish. 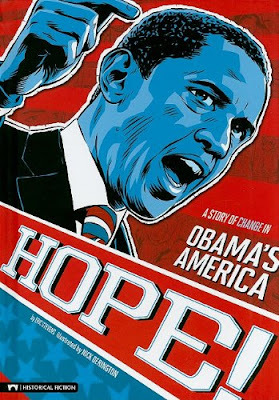 I think HOPE would be most successful and useful in elementary to help children see their potential, build dreams, and engage their future before they lose hope, before they become angry (or angrier), apathetic, despondent, or give up.